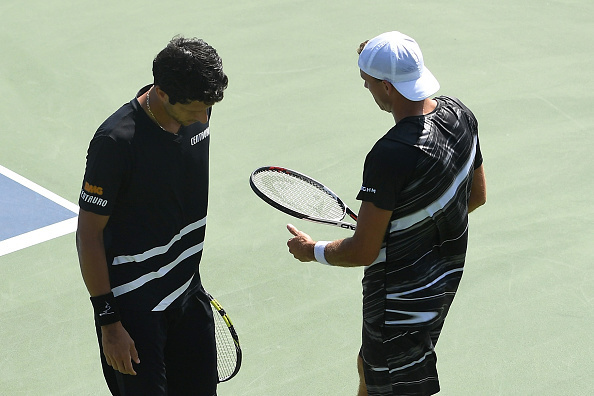 Lukasz Kubot and Marcelo Melo continued their search of a first US Open title as they defeated Pierre-Hugues Herbert and Nicolas Mahut in three-sets to keep their hopes alive. 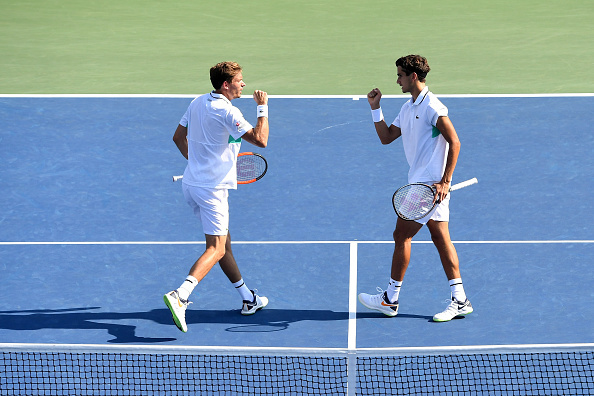 In one of the matches of the tournament on paper, the seventh seeds Lukasz Kubot and Marcelo Melo prevailed 7-5, 2-6, 6-3 against the ninth-seeded Pierre-Hugues Herbert and Nicolas Mahut to book their place in the quarterfinals of the US Open. 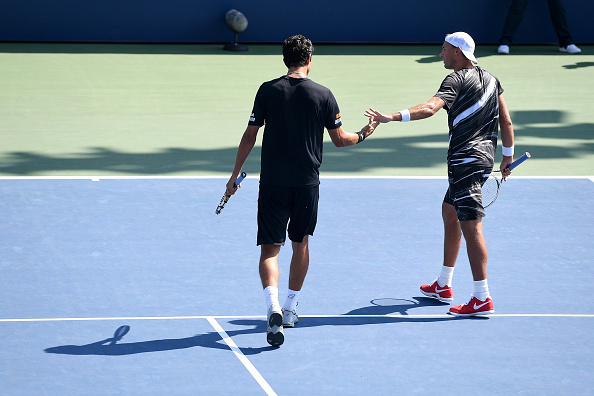 This highly anticipated third-round matchup began with five consecutive holds of serve with Kubot/Melo infront at 3-2. A double-fault by Herbert at 30-all handed the seventh seeds the first break of the match. He managed to save the break point but a volley into the net handed a second breakpoint to Kubot/Melo, who could not take their chances as the French pair held for 3-3. This didn't faze the Brazilian-Pole pair who immediately went back out ahead at 4-3. Again, Kubot/Melo would put pressure on their opponents, and just like on the Frenchmen's previous service game, they would miss two opportunities to break, leaving the match all square at 4-4. Both teams this time would hold serve much easier for 5-5. For the first time in the match, Kubot//Melo faced a breakpoint with the Pole missing an overhead. An ace sent the game to deuce as the seventh seeds held. Saving a breakpoint gave the Brazilian-Pole confidence as a Melo lob put Herbert on the backfoot, allowing Kubot to step in and put away the volley return to bring up match point. The 36-year-old Pole then fizzed a return to Mahut who's volley put it on a plate for the Brazilian to clinch the set, 7-5. Having lost the opening set, the French pair were looking to turn things around and a Herbert forehand return gave he and Mahut two early, much-needed breakpoints. On the backfoot and having to defend, the 27-year-old's attempted lob found it's path to Melo who failed to bury an overhead as he and Kubot fell behind. Herbert consolidated the break to make it 0-2 as momentum shifted in their favor. Three games in and the seventh seeds held serve to get on the board at 1-2. But the Frenchmen's confidence was sky high and another easy hold made it 1-3. Mahut's lob in the next game earnt the French pair a breakpoint chance but Kubot/Melo they quickly snuffed out any danger to make it 3-2. The three-time Grand Slam winners would then be forced to save two break points to hold for 2-4 as Kubot/Melo attempted to get back on level terms. With breakpoints coming and going for both teams, three more would arrive, this time for the 2015 champions. Though they missed on their first chance, a double-fault handed the 2-5 lead to Herbert/Mahut who would save two break points before taking the second set 2-6. In the final set, the seventh seeds would raise their level in the fifth game by closing down the net, forcing the error for love-40. The French duo fought their way to save two break points but couldn't stop the determined seventh seeds in getting what could be a crucial break at 3-1. The Frenchmen then attempted to get back on serve with a breakpoint but KubotMelo wouldn't let their lead slip and eventually consolidated for 4-1. At this point in the match all the seventh seeds could do was hold serve and hope Kubot/Melo would falter but this wasn't the case as they had the chance to serve for a place in the quarterfinals at 5-3. The seventh seeds would be made to work for the match as Herbert/Mahut battled through three match points already and turned the game in their favor with a breakpoint. They would miss their chance to break, and again just a few points later as again a second breakpoint was squandered. In by far the longest game of the match, Kubot/Melo grabbed a fourth match point. This time, they put the three-time Grand Slam champions out their misery to win the match.